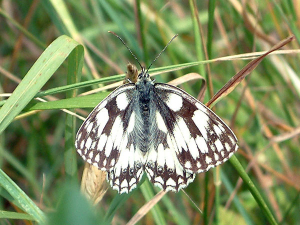 Observation - Marbled White Butterfly - UK and Ireland. Description: A small number of these striking butterflies have been fluttering over the meadow for the past two weeks. I finally managed to get one to sit still for a photo. A small number of these striking butterflies have been fluttering over the meadow for the past two weeks. I finally managed to get one to sit still for a photo.